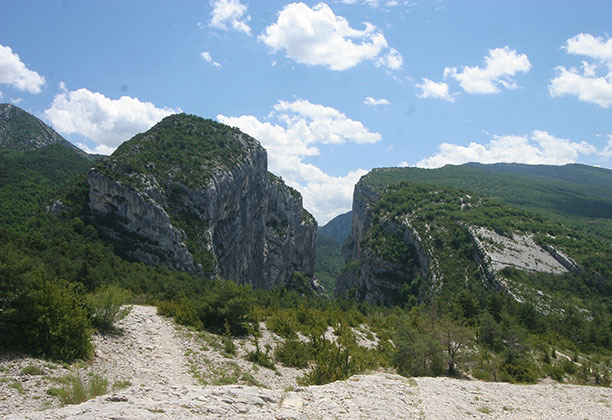 The Verdon Gorge is a river canyon that is often considered to be one of Europe’s most beautiful. It is about 25 kilometres long and up to 700 meters deep. 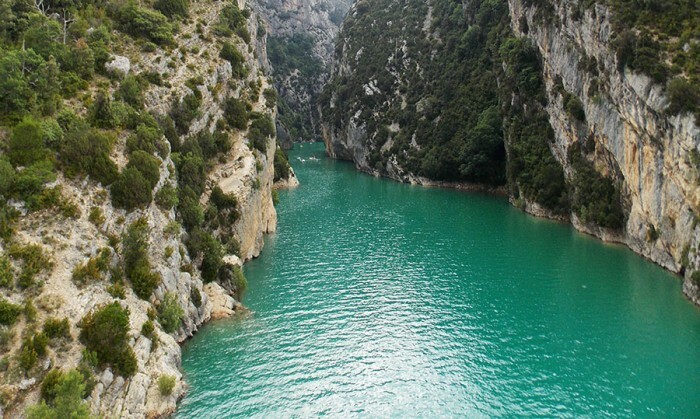 It was formed by the Verdon River, which is named for its startling turquoise-green colour. We were a bit undecided , it was raining and then sunny, there was thunder, we didn’t have the most suitable clothes for a hiking on a stormy day and we had read that this walk was supposed to take about 3 hours! Oh so many things can happen in 3 hours! The sky cleared slightly and so we decided to start off. 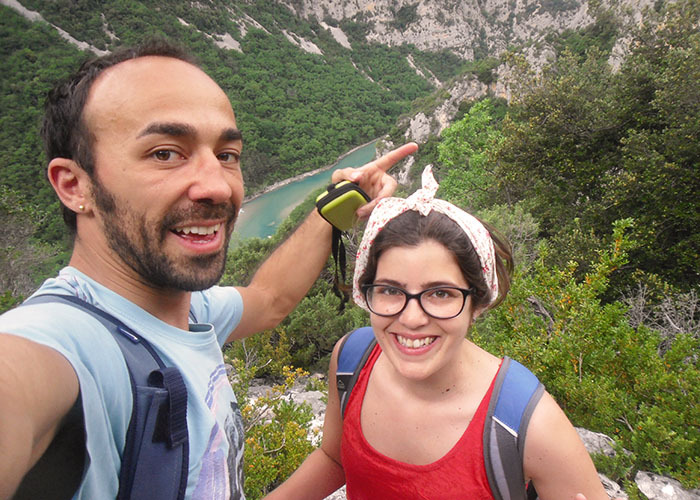 We walked along the Gorges du Verdon, and after walking deeper and deeper down we reached the section that ran alongside the river. Once down there, we met three guys who offered us a ride on their little boat. Why not? After a little while the sky started to cloud over again. We had walked no more than 90 minutes, and it had been 90 minutes downhill, which meant that we were now going to have to walk uphill back to our starting point, where our camper va awaited us. 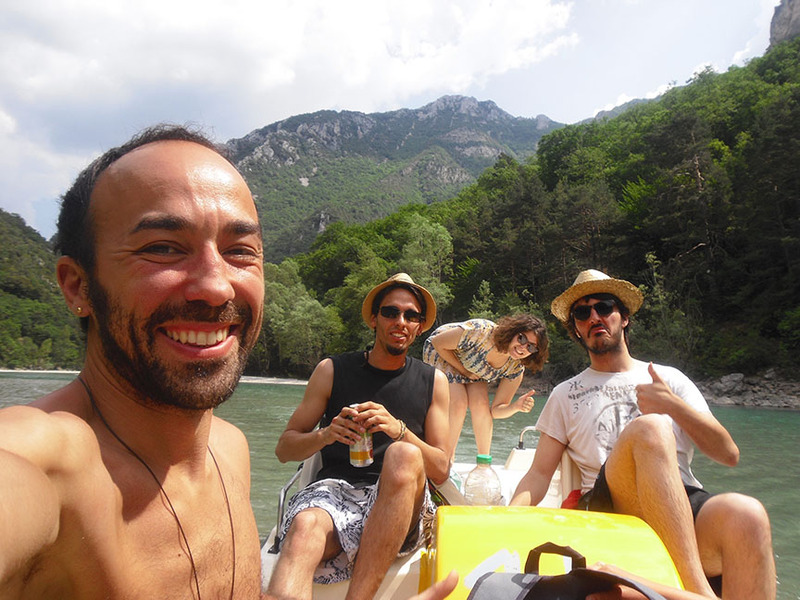 We decided to head back to the riverside where we had been picked up by the little boat and get back onto the route. No sooner had we set off walking again than it started to rain. We were basically walking up an irrigation ditch with water coming down off the mountain and whilst we were initially able to keep our feet dry, we reached a point where we turned and looked at each other and said, this is not the way! There soon became no way to keep our feet out of the water, it was pouring down, the ditch was widening and with it came even more water with every step we took. We reached a level bit of ground and got under some bushes to check the map without getting it wetter than it already was. It looked as though we were on the right path, but right in the middle of the mountain there were some metal poles with red and white tape around them, the sort that you would find at road works to stop people passing. We jumped over it, continued on up the hill and after a wee while we found what seemed to be the last part of the path again. Sentier Martel hike is a long walk, diverse and quite busy, despite means of transport are needed at the other end of the path as it is not a circular one. The hike takes around 6 hours to walk the one way 14km, including a lunch break while enjoying the wonderful landscape around you. From the opposite end, the Parking du Couloir Samson, the first section is quite flat, and we had to climb the 252 steps and make a last effort hiking uphill. Some people do not start from this parking but from another one slightly further, Aubergue du Point Sublime, where the views are great. 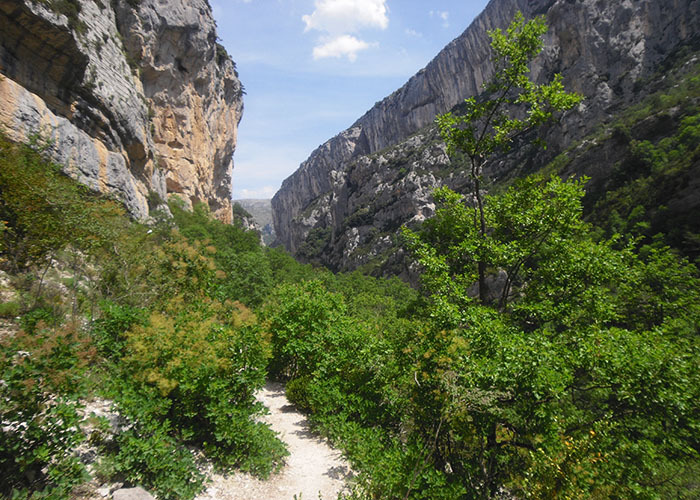 The route is beautiful, with the mountains on one side and the turquoise waters of Le Verdon on the other, with ups and downs along some parts, sections closer to the bank of the river and some other between the tress. It is a long walk but the scenery is worth seeing from beginning to end. 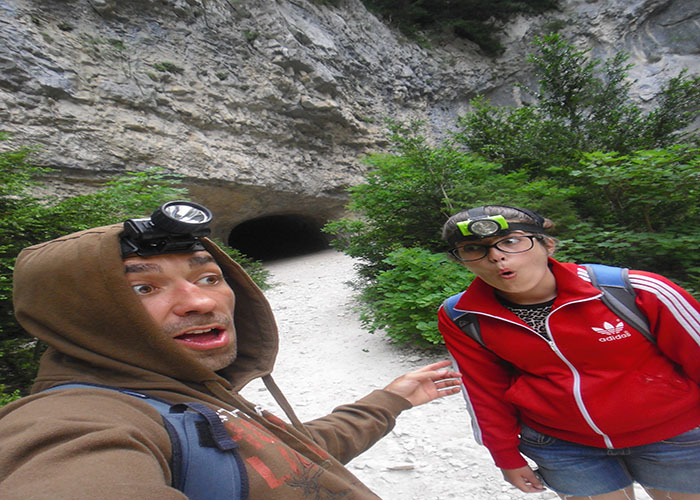 Have you been overlanding France? How was your experience?